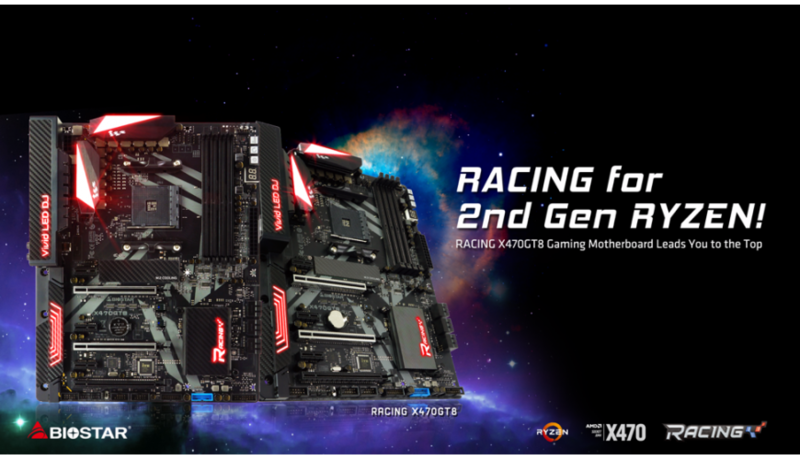 April 13, 2018, Taipei, Taiwan â€“ BIOSTAR unveils RACING X470GT8, a full ATX motherboard with the AMD X470 chipset for the second generation AMD Ryzen processors, Pinnacle Ridge and Raven Ridge. The BIOSTAR RACING X470GT8 offers performance and aesthetics for todayâ€™s overclockers and gamers. It has a premium black RACING themed PCB design, Digital Power+, Hi-Fi zone design, integrated USB 3.1 Gen 2 (Type A + C), Iron Slot Protection, and Advanced VIVID LED DJ for more RGB lighting control. BIOSTARâ€™s exclusive set of features for the new RACING Series motherboards for performance and aesthetics thatâ€™s user-friendly and easy to customize. BIOSTARâ€™s interesting DIY Design features a wide selection of customization and personalization options such as VIVID LED DJ Utility and 5050 LED Fun Zone. The Advanced VIVID LED DJ Utility gives full control and customization on RGB lighting which connected through the 5050 LED Fun Zone headers. BIOSTAR RACING X470GT8 rear I/O ports have the legacy PS/2 connector support 1 x PS/2 for keyboard, 2 x USB 3.1Gen2 ports: 1 for Type A and 1 for Type C, 4 x USB 3.1Gen1 ports, DVI-D, HDMI 1.4, Display Port, Intel GbE LAN Port and 6 x Audio Connectors.